(1) पौराणिक एवं आभिलेखिक स्थलों में प्रसंगित क्रमशः मेघ और मध शब्दों में कौन-सा शब्द वस्तुस्थिति का परिचायक है? अर्थात संबंधित राजवंश का वास्तविक नाम क्या था? (2) संबंधित राजवंश के शासकों की वास्तविक संख्या क्या थी, जिसे पौराणिक पंक्ति में नव बताया गया है. (3) संबंधित शासकों की शासन-सत्ता का समय क्या था, जिसे पार्जीटर ने पौराणिक संदर्भ में तृतीय शताब्दी ईस्वी माना है. (4) संबंधित राजवंश की शासन-सत्ता का क्षेत्र क्या था, जिसे पौराणिक पंक्ति में कोसल की संज्ञा दी गई है. There is yet another pint involved in the analysis of Nagar, the foundamental core of which needs careful consideration. As shown above, he invites our attention to the Purana-passage which alludes to the existence of nine rulers in the Magha dynasty. He seems to believe that the information of the Puranas in this regard can not be justified without postulating the existence of the new king Jayamagha and without distinguishing this king from Vijayamagha. The number of Magha rulers otherwise falls short of one. 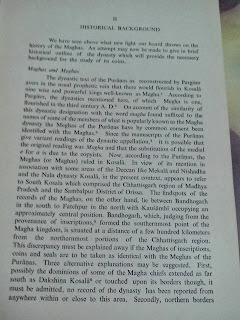 Explaining the position comparatively in a greater detail, Sastry points out that the dynastic text as reconstructed by Pargiter avers in the usual prophetic vein that there would flourish nine wise and powerful kings well known as Maghas, that according to Pargiter, the dynasties mentioned here of which Megha is one, flourished in the third century A.D., that on account of the similarity of this dynastic designation with the word Magha found suffixed to the names of some of the members of what is popularly known as the Magha dynasty, the Meghas of the Puranas have by common consent been identified with the Maghas, that since the manuscripts of the Puranas give variant readings of the dynastic appellation, it is possible that the original reading was Magha and the substitution of the medial “e” for “a” is due to the copysts, that according to the Puranas, the Meghas (or Maghas) ruled in Kosala, that in view of its association with some areas of the Doccan like Mekala and Nishadha and the Nala dynasty Kosala in the present context, appears to refer to South Kosala which comprised the Chhattisgarh region of Madhya Pradesh and the Sambhalpur district of Orissa; that the find-spots of the records of the Maghas, on the other hand, lie between Bandhogarh in the south to Fatehpur in the north with Kausambi approximately occupying the central position; that Bandhogarh, which judging from the provenance of inscriptions, formed the southernmost part of the Magha kingdom is situated at a distance of a few hundred kilometers from the northernmost portions of the Chhattisgarh region, that this discrepancy must be explained away if the Maghas of the inscription, coins and seals are taken as identical to the Meghas of the Puranas. 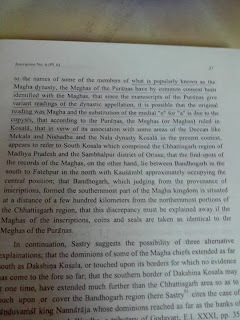 In continuation, Sastry suggests the possibility of three alternative explanations; that the dominions of some of the Megha chiefs extended as far south as Dakshina Koala, or touched upon its borders for which no evidence has come to the fore so far; that the sourthern border of Dakshina Kosala may at one time, have extended much further that the Chhattisgarh area so as to touch upon or cover the Bandhogarh region (here Sastry91 cities the case of Panduvamsi King Nannaraja whose dominions reached as far as the banks of the river Varada, mod. Wardha, a tributary of Godavari, E.I. XXXI, pp. 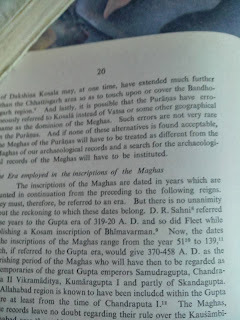 35-36); that the Puranas have erroneously referred to Kosala instead of Vatsa or some other geographical name as the dominion of the Maghas; that such errors are not rare in the Puranas and if none of these alternatives are acceptable, the Meghas of the Puranas will have to be treated as different from the Maghas of our archaeological records and a search for the archaeological records of the Meghas will have to be instituted. It is evident from the notes and observations of Altekar and Sastry that the Purana-passage under reference is not free error and consequently its authenticity also is not unquestionable. Its wording even though meticulously reconstructed by Pargiter taking into consideration the variants dispersed in the extant manuscripts hardly makes it useful for the purpose of history. The employment of the expression Megha instead of Magha makes one believe, at least at the first glance, that the passage has its reference to some other ruling house and not to that one which is introduced by the antiquarian records explored so far. If this is taken for error attributable to the copyist of the text, then in that case we will have to locate the particular situation responsible for this kind of error. But the fact remains that any such attempt is likely to be a futile exercise for want of requisite data on the point. 93) E.I. XVIII, p.160, pl. No. III. The Dynastic text of the Puranas as reconstructed by Pargiter avers in the usual prophetic vein that there would flourish in Kasala nine wise and powerful kings well-known as Megha.1 According to Pargiter, the dynasties mentioned here, of which Megha is one, flourished in the third century A.D.2 On account of the similarity of this dynastic designation with the word megha found suffixed to the names of some of the members of what is popularly known as the Magha dynasty the Meghas of the Puranas have by common consent been identified with the Meghas.3 Since the manuscripts of the Puranas give variant readings of the dynastic appellation,4 it is possible that the original reading was Magha and that the substitution of the medial e for a is due to the copyists. 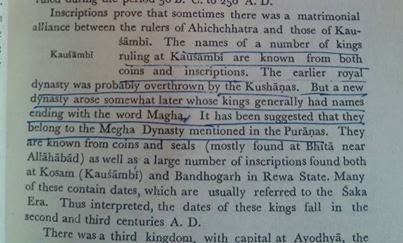 Now, according to the Puranas, the Meghas(or Maghas) ruled in Kosala. In view of its mention in association with some areas of the Deccan like Mekala and Nishadha and the Nala dynasty Kosala, in the present context, appears to refer to South Kosala which comprised the Chhattisgarh region of Madhya Pradesh and the Sambalpur District of Orissa. 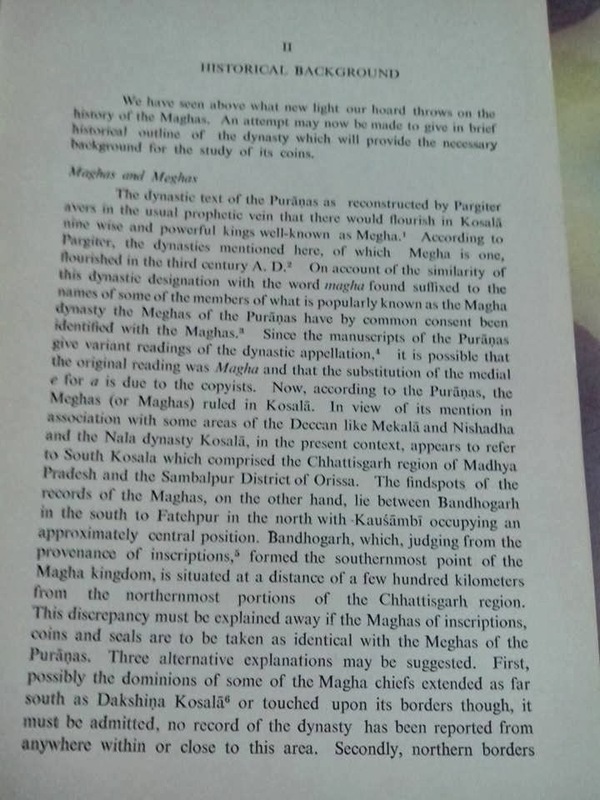 The find-spots of the records of the Maghas, on the other hand, lie between Bandhogarh in the south to Fatehpur in the north with Kausambi occupying an approximately central position. Bandhogarh, which, judging from the provenance of inscriptions,5 formed the southernmost point of the Magha kingdom, is situated at a distance of a few hundred kilometers from the northernmost portions of the Chhattisgarh region. This discrepancy must be explained away if the Maghas of inscriptions, coins and seals are to be taken as identical with the Meghas of Puranas. Three alternative explanations may be suggested. 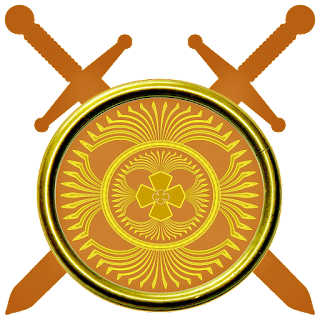 First, possibly the dominions of some of the Magha chiefs extended as far south as Dakshina Kosala6 or touched upon its borders though, it must be admitted, no record of the dynasty has been reported from anywhere within or close to this area. 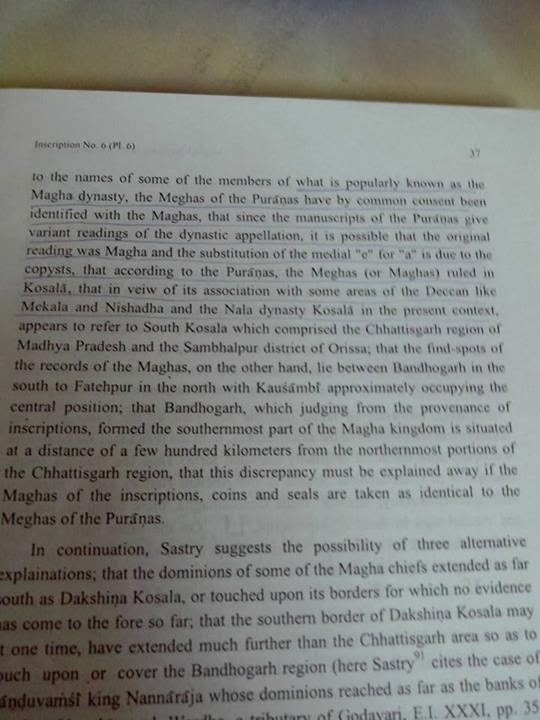 Secondly, northern borders of Dakshina Kosala may, at one time, have extended much further than the Chhattisgarh area so as to touch upon or cover the Bandhogarh region.7 And lastly, it is possible that the Puranas have erroneously referred to Kasala instead of Vatsa or some other geographical name as the dominion of the Meghas. Such errors are not very rare in the Puranas. 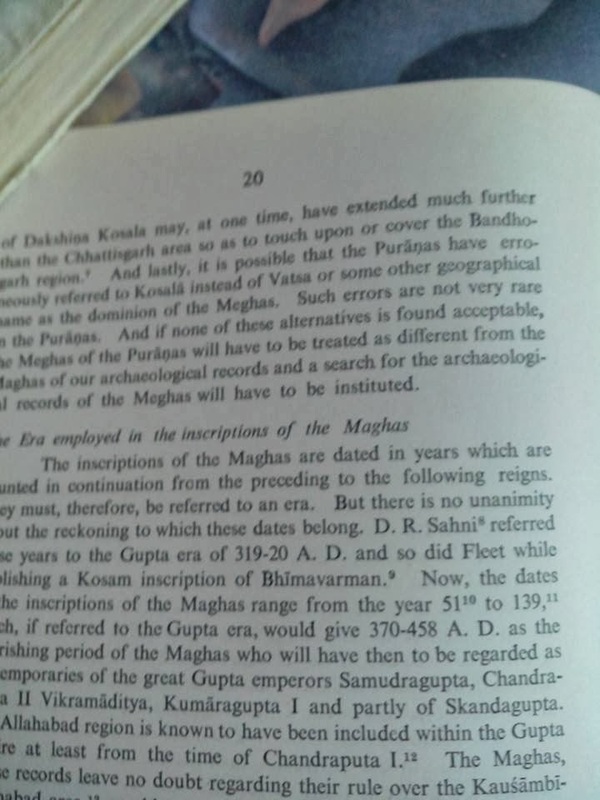 And if none of these alternatives is found acceptable, the Meghas of the Puranas will have to be treated as different from the Maghas of our archaeological records and a search for the archaeological records of the Meghas will have to be instituted. 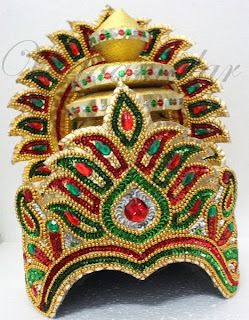 Megha iti samakhyata buddhimanto nav-aiva tu. 3. This view is, however, not accepted by some scholars. See Jagannath Agrawala in Comprehensive History of India, II, p.259, note 4. 4. 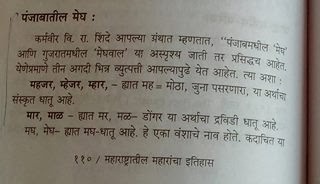 Medya and Medhatithi are mentioned by Pargiter as variants in place of Megha and Megha iti respectively. 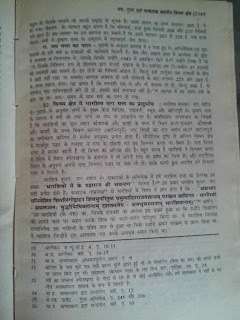 See The Purana Text of Dynasties of the Kali Age, p.51, note 21. 5. According to K.D. Bajpai, some Magha coins also have been found at Bandhogarh. 6. Altekar thinks it possible that in the heyday of their glory, the Magha kings ruled over wide territories extending from Bilaspur in the south to Fatehpur in the north, vide JGJRI, I, P.159. 7. Limits of provinces are known to have changed with political vicissitudes. 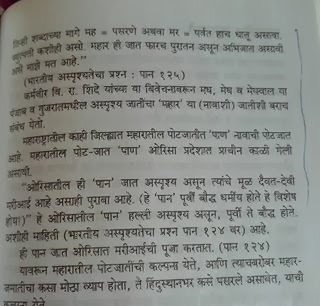 To cite an example, Dakshina Kosala once appears to have included a part of Vidarbha. The senkapat inscription of the time of the Panduvamsi king Maha-Sivagupta Balarjuna of South Kosala shows that the dominions of his predecessor Nannaraja reached as far as the banks of the river Varada, mod. Wardha, a tributary of the Godavari. See EI, XXXI, pp.35-36. Know your history as told by historian; Prof. Radheysharan-"विन्ध्य क्षेत्र का इतिहास( वृहतर बघेलखंड)" -2001;पृष्ठ- 166 to169. "मेघ पर्वतीय क्षेत्र में रहने वाली एक आदि जाति है। मेघ एक ऐसी जाति है जिसका समुदाय या जातीय प्रकार का नाम है। बाद की बहुत सी जातियां जो पेशे या व्यवसाय से अलग बनी वे इसी स्रोत से निकली।कन्निघम के मतानुसार पश्चिमी पर्वतीय क्षेत्र मूलतः ऐसे लोगों द्वारा बसाया गया जो मध्य भारत में निवासित कोल लोगो के सामान ही थे। हम ठीक से यह निष्कर्ष निकाल सकते है कि इनके पूर्वज ही प्राचीन काल में इन पर्वतों में सबसे पहले बसे। बाद में इनको दूसरी जातियों द्वारा चुनौती मिली निसंदेह वह शादी विवाह और अन्य संबंधों से परिचालित थी । उनके रीति रिवाज और परम्पराएँ इस ओर इंगित करते है।" Punjab gazetteer volume 22a gazetteer of chamba state. Part -A;1910 pp 163 edited by Samual T Weston.